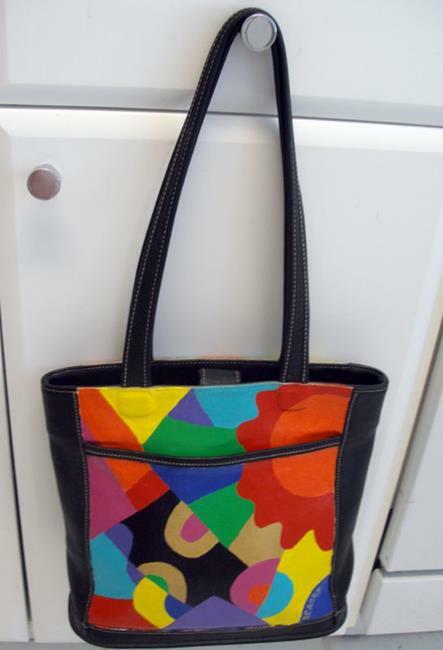 This piece is a recycled Coach handbag accessory purse or tote bag that was so much fun to create, because I really got the feeling of "breathing new life into" this old bag. Because there's colorful abstract artwork on both sides of this bag, its like getting two pieces of art in one -(I do show both sides here). 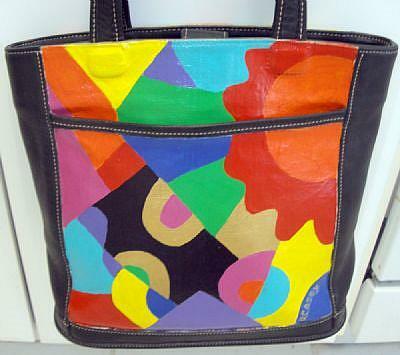 I wanted to inject some fun and life into this old, *(but very high quality) leather-trimmed Coach purse, so I used mainly bright Golden acrylic paints and went to town on it. I really wanted this bag to get noticed by people! The colors here are so bright, that everyone will take notice of it, now matter where you go, (I've worn it and gotten tons of compliments) and there's even some iridescent gold in a few areas, (to signify the "bling" or wealth that you will hopefully always enjoy with this bag). 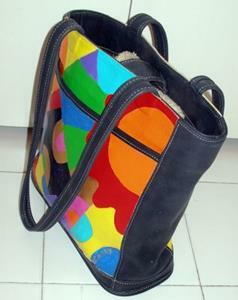 If this bag doesn't brighten your day, nothing will! It measures approx. 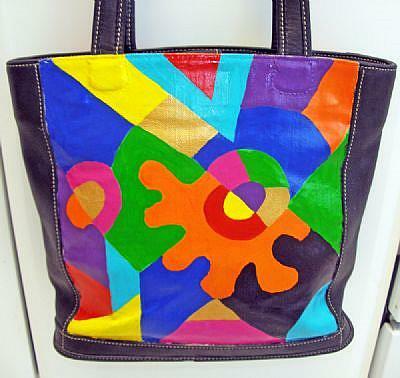 11" L x 10" H x 4.5" W, and is truly a "One-of-a-Kind" piece of artwork on a handbag, and will be noticed by everyone -- your friends will wonder where you got this wild and funky piece of bright, bold wearable "trashion" art!